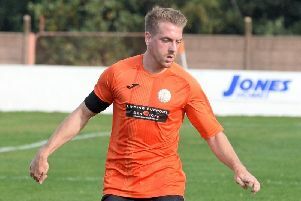 A difficult week finished on a positive note for relegation-threatened Rossington Main as Lee Holmes’ side picked up a vital three points with a dramatic 2-1 win over in-form Grimsby Borough. Saturday’s Division One victory came just days after Main’s clubhouse had suffered a break-in. After picking up just a single point from the previous eight outings it was a very welcome victory for Holmes’ side. The importance of the win was reflected in the league table with Rossington now eight points clear of next-to-bottom Worsbrough Bridge Athletic, whose two games in hand will not be sufficient to overall the Oxford Street outfit. Jordan Hatton’s superb finish gave Main a 28th minute lead, only for Grimsby to level eight minutes later through debutant Louis Grant. Holmes (pictured right), however, won it in time added on as he tucked away his 11th of the season from the penalty spot. Rossington and Worsbrough could both already be safe with the NCEL committee set to make a decision on the future of troubled Hull United. The Division One promotion hopefuls have been unable to obtain a ground/ground share agreement for next season by the March 31 deadline and could now face being kicked out of the league. Indeed Hull, whose manager Curtis Woodhouse resigned last week, are Rossington’s next opponents with the two teams meeting at Oxford Street on Saturday in what is officially Hull’s home game.